Just outside the big, popular, metropolitan hubs in California exists a wild part of the state few people know about. Rural regions full of Native American and gold history, a lost coast, volcanic bubbling, cracked desserts, and rural landscapes that feed the nation. Among all of that, there are ample adventures to be had and culinary delights to try. Get off the beaten path and see 8 regions of California in a new way; rugged, natural, unadulterated places that are prime for human-powered activities. 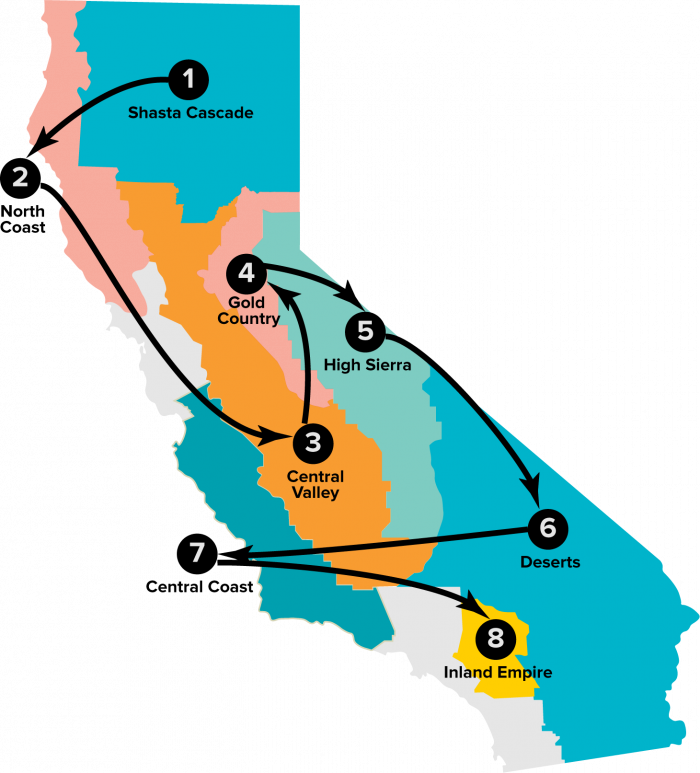 You think you know California, but you’ll soon see beyond the urban areas and into new regions of California that will capture your wild and adventurous spirit. Our team of adventure storytellers explored the wild side of California on a three week adventure, and they've shared the best of Wild California on this page, including curated itineraries, photos, videos, the best experiences, and more! Make sure you’re a part of our community to be the first to receive the Wild California adventure updates. Lassen Volcanic National Park, in Shasta Cascade Region, is home to 500 lava caves. Redwood National Park, in the North Coast Region, is home to the tallest trees on Earth. Easily spot migrating gray whales along the Mendocino Coast in Northern California. The population density of farm-rich Central Valley is only 155 people per sq. mile. Find the sweetest strawberries, fresh organic vegetables, and farm-to-table experiences here. The discovery of gold in 1848 brought more than 300,000 people to the Gold Country. And you can still pan for gold today. The Sierra Club was co-founded by naturalist John Muir to protect the Yosemite National Park in the High Sierras. California’s desert once was home to Mojave Native American Tribe thousands of years ago, who left their stories in the form of petroglyphs. The Guadalupe-Nipomo Dunes are the highest beach dunes in Western USA, some towering even 500 feet high, found along Highway 1 in California. Lake Elsinore is Southern California’s largest natural freshwater lake. Follow along as our team of storytellers explores the wild side of California on a three week adventure!